MKM has completed a series of high profile civic enhancements, including urban and corporate plazas, waterfront revitalization plans, urban master plans and campus plans and improvements. These projects involve complex environmental and planning issues which direct and influence design directions. MKM is adept at working within the framework of agency requirements in order to integrate functional and meaningful site improvements with existing land use patterns. 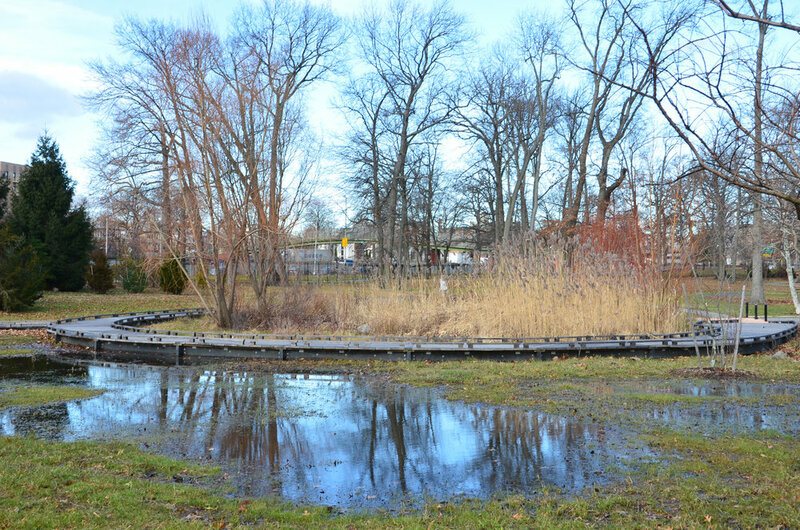 MKM designed the Pelham Bay Pond Walk as an extension of the adjacent Playground for All Children, the first US playground designed for disabled and able-bodied children. The Pond Walk is a path and elevated boardwalk that encircles the pond and offers universal access and close-up views to the animals, insects, and seasonally flowering plants within and surrounding the pond. Funding for the project was provided by the Friends of Pelham Bay Park. MKM Landscape Architecture, the prime consultant, master planned and provided all construction documentation for the total reconstruction of the Queens Zoo and Children’s Farm, including all animal habitats. This 5 acre zoo, on the site of the 1964 World’s Fair, exhibits animals native to North and South America, and features an aviary, sea lion exhibit, wolf exhibit, children’s farm, and extensive pond system for aquatic related life. Naturalized habitats were designed in conjunction with wildlife specialists, using artificial rock and native plant material. MKM prepared a master plan and developed a new 50 acre park on the site of a historic former reservoir in the Ridgewood section of Queens, New York. The original reservoir, consisting of three large basins, was constructed in 1858 and associated infrastructure such as pump house buildings, historic fencing, gate valves and granite sluice structures still remain largely intact. Each basin contains a diverse group of ecological habitats that have developed since the reservoir was decommissioned in the 1980s. The vision for Ridgewood Reservoir was to create a dynamic, sustainable park that would preserve, restore and enhance the site’s rich historical features and unique ecology while providing recreational, social and educational opportunities for visitors. Designated a key undeveloped destination park in the Mayor’s PlaNYC 2030 report, Ridgewood Reservoir was planned to be a regional open space that celebrated the site’s important hydrologic history and provided enhanced amenities to nearby under served communities. Established as a New York City Landmark as well as a National Historic Landmark, Bartow - Pell Mansion is the last remaining of a group of estates overlooking the Long Island Sound at Pelham Bay. MKM Landscape Architecture PC worked with the BPMM Executive Director and the Bartow-Pell Conservancy Garden Rehabilitation Steering Committee to rehabilitate the formal sunken garden in a manner that honors the history of the garden and also can be easily maintained by the museum staff. MKM successfully guided the proposed rehabilitation plan through a review process at the NYC Department of Parks and Recreation. As a Capital Projects consultant for the City of New York, Mark K. Morrison Landscape Architecture PC prepared construction documents for the reconstruction of the promenade along Riverside Drive between West 79th and West 87th Streets. This project restored the historic hex block and cobblestone paving, reconstructed the stone retaining wall, and installed new benches, trash receptacles and lights, reflective of the site furnishings in adjacent Riverside Park. Large existing trees were protected by increasing the size of the tree pits and leveling the surrounding paving. This award winning project, at 110th St. and Fifth Avenue in New York City, represents an urban design effort in which MKM was responsible for the overall design, construction documentation and specifications for the reconstruction of this traffic intersection and important civic plaza. The monument, a collaborative effort between Artist Robert Graham and MKM, memorializes the life of jazz great Duke Ellington by creating an open amphitheater for public musical performances. MKM collaborated with architects to develop all exterior open space surrounding this urban housing complex. In order to provide a link between the two buildings and pedestrian friendly scale against the backdrop of the 10 story buildings, MKM designed a trellis over proposed parking spaces between the two towers, providing an aesthetically pleasing backdrop and unifying vertical element for the central courtyard. Located on the old Schaefer Brewery site, this 1.6 acre residential development in Williamsburg includes a courtyard overlooking the East River with spectacular views of Manhattan and three roof-top terraces. The project included both market-rate and affordable housing units. The New York Hall of Science’s Rocket Park Miniature Golf Course uses play and whimsy to teach visitors about space exploration and rocket science. Located adjacent to the Hall’s iconic rocket display, the course combines a colorful and creative layout with lush plantings. Bio-retention swales are planted with native plant material. Rocket Park’s ultimate success lies in its ability to bring student centered, education based science exploration out of the classroom and into the landscape. MKM Landscape Architecture was responsible for all the programming for the North Residential Neighborhood at Battery Park City. This effort involved an extensive interagency and community participation component and successfully set the precedent for future schematic designs for this 10 acre recreational open space. MKM worked closely with artists to create site specific pieces, including the “Upper Room”, with Ned Smythe, and “Sitting Stance”, with Richard Artschwager. Strengthening the Security of the United Nations involved a thorough assessment of perimeter and internal access conditions, with redesign of perimeter fencing and plantings and redesign of vehicular and pedestrian security infrastructure. Perimeter Fence design options were based on the historic International Design Style originally developed for the site.